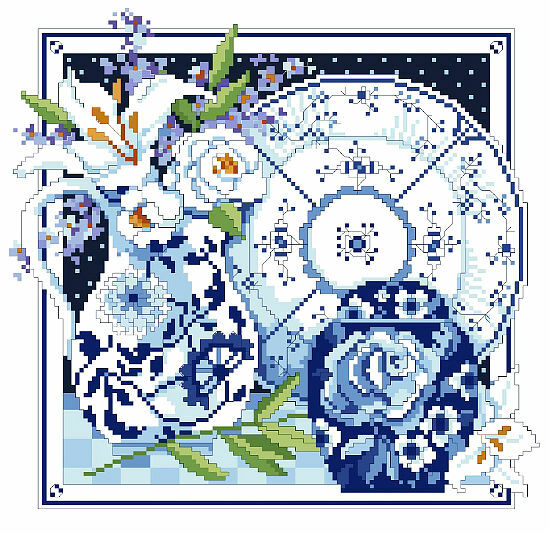 Beautiful shades of blue are used in our design of a still life in the classic blue and white china of Willow Ware and Royal Copenhagen. This cool toned piece would look striking in any kitchen or dining room. We even added the flower arrangement so that you will have cut flowers every day. Contents: Stitch Count 128w x 121h, finished size on 14ct: 9" x 9"